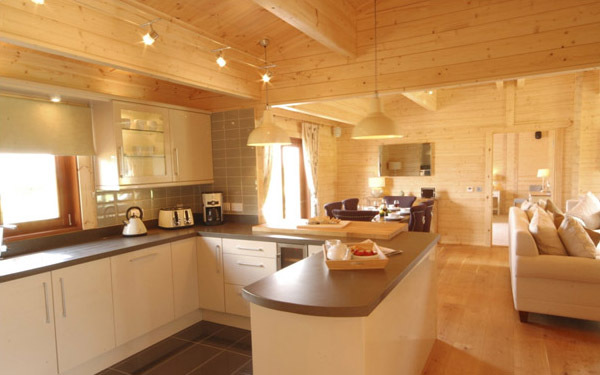 Fynn Valley luxury lodges are the ultimate indulgence in self-catering; offering space, luxury and comfort above and beyond your expectations. 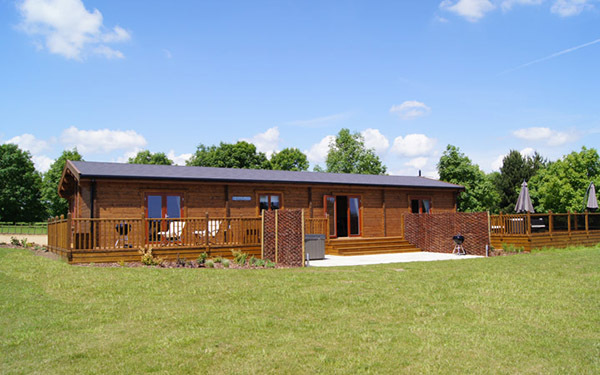 Spacious, light, beautifully designed and superbly equipped, Fynn Valley lodges are set in a delightful corner of the Suffolk countryside, yet are only four miles from Ipswich and within easy reach of some of the county’s best-loved destinations. 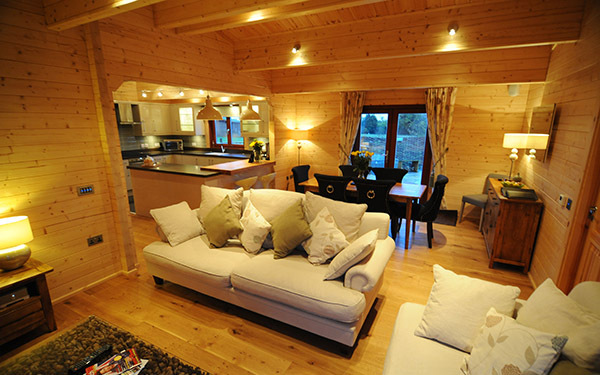 Our sumptuously furnished lodges have huge sofas, super king-sized beds and private saunas. Encircled by sunny verandahs, each lodge sits in its own landscaped garden, with a hot tub enclosed within a private patio. 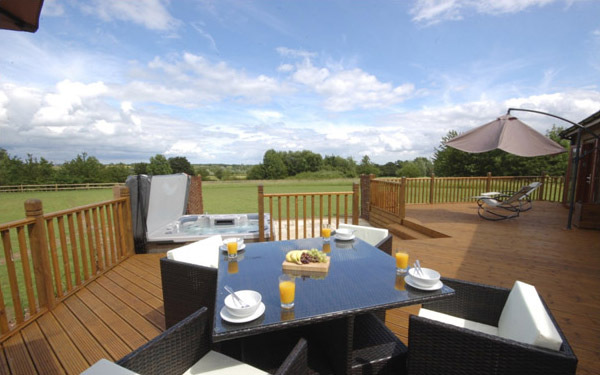 In every detail, Fynn Valley Holidays epitomize exceptional quality. 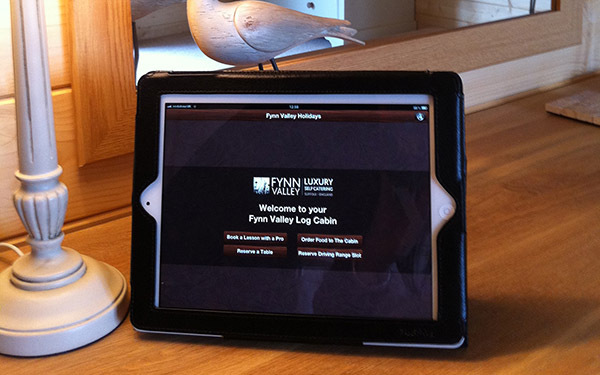 Each of our Lodges features an iPad for you to use during your stay. Enabling you to create the perfect ambience, our iPads control the lighting around your lodge and also stream radio or music from your iPod or iPhone via our Sonos music system, all from the comfort of your sofa. Our own uniquely designed app enables you to order freshly prepared food to the door of your lodge, make restaurant and golf reservations as well as giving information on the local area and place to visit. 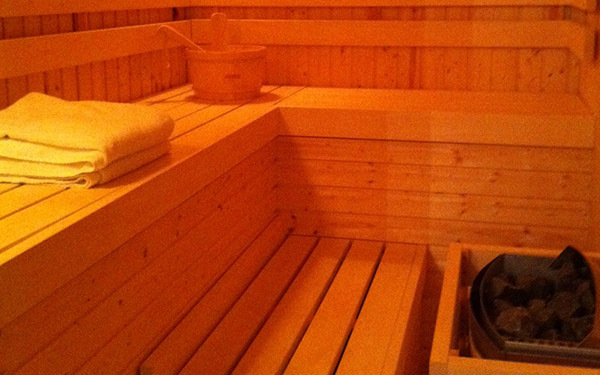 Step into your sauna, and close the door on the rest of the world. Our private internal saunas offer the perfect retreat. 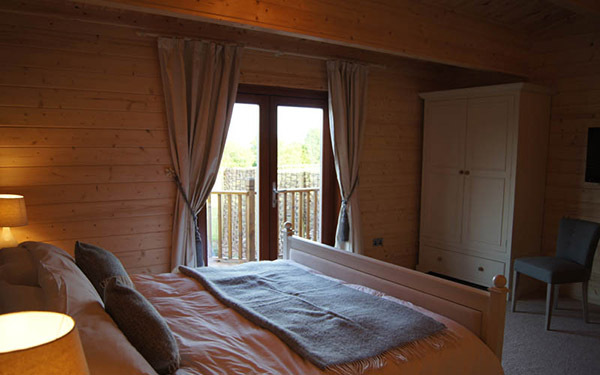 Temperature controlled to your liking, our saunas can also be set on a timer delay, ready for your return from exploring the beautiful Suffolk countryside. Sit back and let the massaging jets and soothing heat relax your body and mind. Set in a quiet corner of your private patio, our large hot tubs feature a variety of seating areas to soothe all parts of your body. 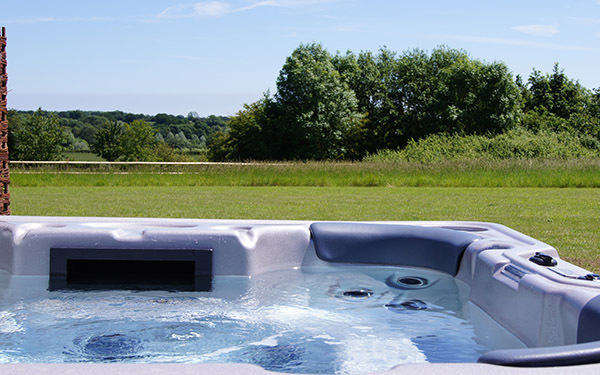 Star gaze with a glass of something chilled or relax during the day – either way, our hot tubs offer the perfect environment in which to really escape from it all. 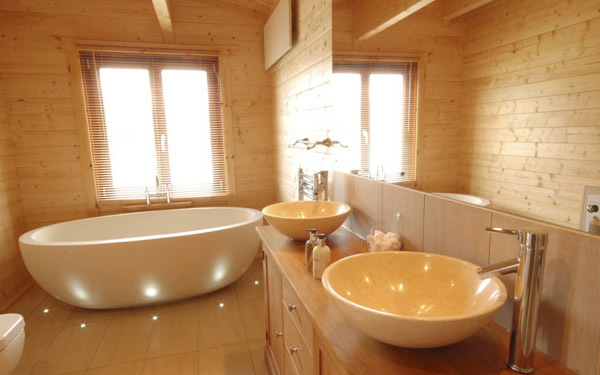 Imagine lying back in your stunning designer bath tub with ambient floor lighting, or refreshing in your large, walk-in shower.... Twin basins offer a feeling of space, whilst underfloor heating, heated towel rails and infrared heaters maintain the perfect temperature in which to really relax. Offering the perfect space to express your culinary skills, our extremely well-equipped kitchens are fitted with top-of-the-range appliances including a Smeg fridge freezer and oven. Whilst the wine fridge will keep all your drinks at the perfect temperature, there’s also a dishwasher, washer/dryer, microwave and coffee machine. A beautiful solid oak breakfast bar and bar stools make the kitchen area a very sociable area. Fancy a quiet night in snuggled up on the sofa? Whether it’s to chat with friends, listen to music via your iPad or sit back and enjoy your favourite programme on your Lodge’s flat screen Smart TV, our comfy lounge areas with large sofas and driftwood coffee tables provide the perfect space to really unwind. 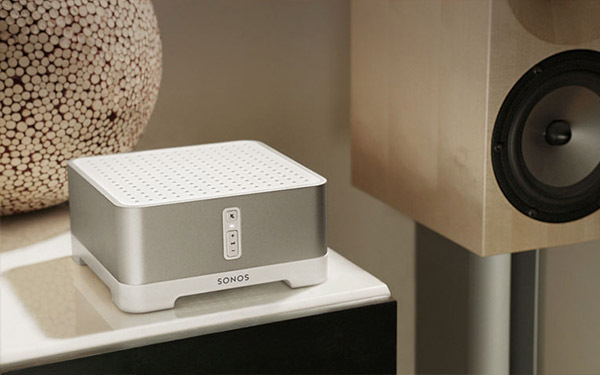 Allowing you to play your own music or listen to your favourite radio station via your Lodge’s iPad, or SONOS system is the ultimate sound system. This fantastic system controls music type and volume by area. You can even listen to different music in different rooms, should you so wish. Just place your iPhone or iPod in the base and all your music can be accessed at the touch of a fingertip. Private drive with space for three cars.